I've had Pasta with Lemon, Broccoli, Walnuts, and Toasted Breadcrumbs from Susan at Food Blogga on my Foodie To-Do list (over there on the right sidebar) forever. In fact, it may have been one of the recipes that inspired me to start the list in the first place, that's how long I've wanted to make this dish. Many of my favorite flavors rolled into one meal. Now that's efficiency! I'm happy to say that I finally got around to crossing it off the list. With a few changes (i.e. adding in a LOT more lemon than the recipe called for), I hit the sweet spot where everything came together quite nicely. This was my first time making fresh breadcrumbs (I've always used the canned variety, which I have been informed is the ultimate foodie faux pas), so that was empowering. Yeah. I made a batch of Ina Garten's Garlic and Herb Tomatoes (recipe coming soon) on the side, and wound up tossing a bunch in with the pasta as well. It added a lot more flavor and color, which is never (ok, rarely...) a bad thing. 1. Preheat oven to 325 degrees. Layer walnuts on a baking sheet, and bake for 10 minutes, until slightly golden and aromatic. 2. To toast the breadcrumbs, place in a skillet on the stovetop; slightly shake until golden and evenly toasty, just a couple of minutes. Remove from pan, so that the heat won’t continue to toast them. 3. Cook pasta in salted water according to directions. 4. Add olive oil to a skillet. Over medium heat, sauté garlic and shallots until slightly caramelized. Add the broccoli, lemon juice and zest, red pepper flakes, and salt. Cook for 3-4 minutes or until the broccoli turns a brilliant green and remains firm to the touch. Add your cooked pasta to the skillet with the broccoli mixture, and toss in the toasted walnuts and breadcrumbs. Taste and squeeze more lemon juice in to reach desired flavor. 5. Sprinkle with a healthy dose of grated Grana Padano cheese and some fresh parsley. Finish with a drizzle of good extra virgin olive oil. I adore lemon pastas for when you want to make dinner but don't have many fresh ingredients. And as a 'more is more' person, I add a ton more lemon and cheese than most recipes called for. Topped with some toasted pine nuts and a bit of fresh herbs? Divine! Yum. Love the toasted breadcrumbs in there... and broccoli and lemon is never a bad combo. I think I would have thrown tomatoes in too. Yum!! Your photos are so beautiful - I think that they would make ANYTHING look appetizing! Hope all is well in Eugene!! This looks like a delicious meatless meal! The use of breadcrumbs is a great idea to add some flavor and texture... 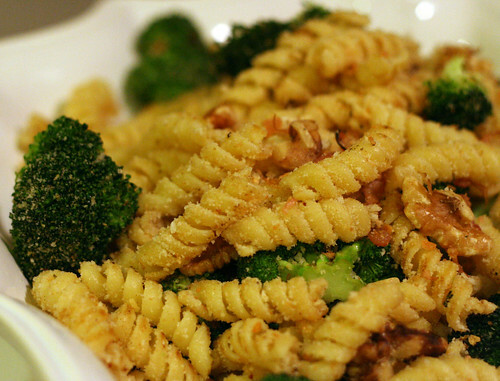 I'm so going to try incorporating breadcrumbs into pasta dishes more! Oh YEAH, this is my kinda meal! Totally going on next week's meal plan. Plus, it's all tasty stuff the husband loves, too. Sure to be a winner. This looks and sounds really good - it incorporates some of my favorite flavors as well. I've also never made my own bread crumbs... did it make a substantial difference? Thanks everyone, it was delicious! @Liz~ I would say it made a difference, but not a substantial one versus the amount of effort it took. I'm going to keep trying with fresh ones and see if I can get the technique down, though...I had some trouble getting the bread crisp/stale enough to work well.